TOMRV is the Tour Of the Mississippi River Valley, a Midwest cycling tradition since 1978. Every year 1,000 bicycling enthusiasts come to ride the TOMRV tour. They enjoy a well supported, challenging ride on scenic roads, through Midwest farmland, and along the Mississippi River. I invite you to look into our tour whether you are an experienced tour rider or just getting started. You will find a great weekend cycling experience with riders from across the Midwest. If you belong to a cycling club anywhere in the Midwest, then probably you have friends riding with us. You will have top-notch support services on the tour. The Quad Cities Bicycle Club provides many rest stops on the way with free food and refreshments. Additional food is sold along the route by civic and church organizations. Upon arriving at Clarke, the legendary TOMRV banquet is waiting for you. Clarke University opens their dormitories for our overnight stay. This is TOMRV, a tradition of good riding, good scenery, challenging hills, good food, and an overall good time. So if this is for you, then plan to ride with us this year. TOMRV provides emergency bicycle repair on the route and at Clarke University. There is a free secure bike lock-up area at Clarke University with an overnight guard. Massage tables are available at Clarke on Saturday afternoon for a separate charge. After your Saturday ride, relax at the Clarke Beer Garden. Each year we have live music. A breakfast buffet is available on Sunday morning at Clarke for a separate charge. Showers are available at Goose Lake and at Bettendorf at the end of the ride. TOMRV will start on Saturday morning, most riders leaving between 6AM and 8AM from Scott Community College in Bettendorf, or between 7:30AM and 9AM from Northeast School in Goose Lake. Both locations have ample and safe parking for the weekend. 1. Scott Community College from 5:30 p.m. to 8:00 p.m. on Friday evening (Recommended). 2. Northeast School in Goose Lake on Saturday morning from 7:30AM to 9AM, the Goose Lake start location. 3. Scott Community College from 6AM to 8AM at Scott CC start location. A wristband entitling you to food at TOMRV sag stops, and admission to the banquet. A packet with queue sheets and other ride information. A luggage tag to allow your bag on our trucks for delivery to Clarke on Saturday and back on Sunday. This year's ride tee shirt. This year's ride Jersey and patch if your have ordered them. On-line registration opens on Dec 1, 7:00AM at Get Me Registered. Or you can register by mail - print and mail an application form, and pay by check. New this year: Online registrations will be accepted until Noon on June 9, the day of packet pickup. Your registration fee covers sags and other road support, services at Clarke University, the banquet on Saturday evening, and a ride tee shirt. Jerseys and rooms at Clarke on Saturday night are purchased separately as you need. Early registration is discounted according to the chart below. In addition, riders 25 and under receive a $20 discount and QCBC members receive a $5 discount. You can see all the charges by viewing this year's application form. Clarke rooms are preferred by many riders, and they run out early. As rooms are taken on the online system, each room type will count down. When the count reaches zero, that type will no longer appear on the online registration form. Last year, suites were all taken on the first day. Please register early if a special room type is important to you. For 2019, we will be using Voler jerseys. We used Voler in 2017. 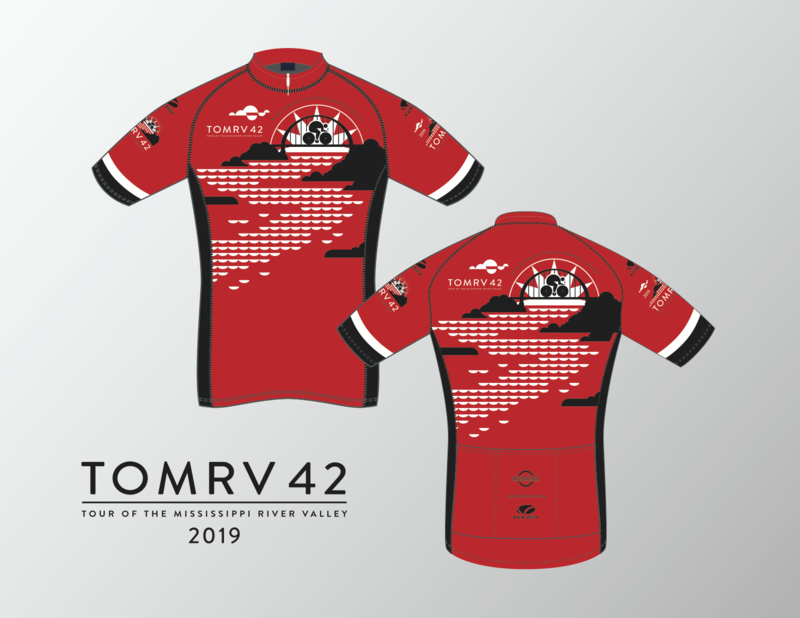 If you participated in TOMRV in 2017 and ordered a jersey, please use that as a guide when ordering for 2019. Note: the sleeveless jersey is a hybrid fit. That means it is between the race and club fit. Take that into consideration when you order a sleeveless jersey. Women's jerseys will have a relaxed hem. Men's jerseys will have a gripper hem. Jersey will have a full-length zipper. You may want to visit the Voler website (Voler.com) to look at sizing guidelines before ordering. A change for 2019: you will need to order a jersey before the cut-off date. The cut-off date is April 6, 2019, at 11:59 p.m. We will not be selling jerseys on registration day; therefore, selecting the best size for you is important. We will not have extra jerseys at registration for trading sizes.